"The Municipality called East St. Louis, Illinois, was officially established on April 1, 1861. The small town soon grew to a bustling city at the center of the booming St. Louis economy (St. Louis would be the fourth largest city in the United States by 1870). East St. Louis was home to major factories, endless railroads, and extensive river commerce. It was home to expansive parks, stout churches, and high-quality schools." "The people of East St. Louis were as colorful and varied as they come. They arrived here from across the United States and Europe, lured by the promise of employment. East St. Louisans worked hard. Despite the struggles, the people persevered. Amazing talent came from here-world-class musicians (Miles Davis, Ike Turner), professional athletes (Hank Bauer, Bryan Cox, Jimmy Connors), and Olympic champions (Jackie Joyner-Kersee, Dawn Harper), as well as scholars and statesmen." --Bill Nunes and Andrew Theising, "Introduction" in Images of America: East St. Louis, (Charleston: Arcadia Publishing, 2011), 7. 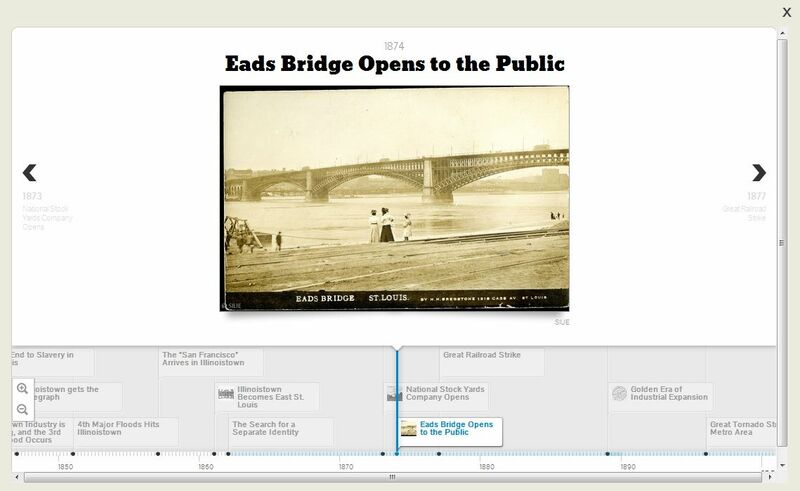 The East St. Louis Timeline is an interactive tool designed to offer an overview of history. It gives the user an opportunity to see what was happening in East St. Louis, St. Clair County, the state of Illinois, and the Nation at approximately the same times. It is designed to help build historical connections between events. For example: In May and July of 1917 East St. Louis suffered from the destruction caused by Race Riots. In the latter month, approximately 200 people were killed and 6,000 African Americans were left homeless. On July 28, 1917 New York City hosted the Silent Parade protesting the East St. Louis riots. Likewise, from July 27 to August 3, 1919, two years later, Chicago experienced a similar situation when race and immigration riots erupted. The purpose of the Virtual East St. Louis Historical Society is to provide an online past and present vision of the East St. Louis community. The virtual collection includes document archives, maps, photo galleries and videos. It is the aim of this project to provide students, teachers and the general public with important information that will enhance their knowledge of the great city of East St. Louis. The collection and archives can be utilized as a primary source for individuals who want to further the legacy of the city. All donations can be made through the Institute for Urban Research to be added to the Southern Illinois University Edwardsville Bowen Archives.